Built by marketers and big data gurus who understand that modern marketers need the most complete, granular marketing data available. Deeper, more powerful insights than any other vendor can give you. That’s the promise we deliver with our Metis Marketing Suite. How do you succeed tomorrow if you don’t have good data to analyze today? It’s the struggle of modern digital marketers. Internet citizens leave data everywhere they go. All you need to do is collect it and use it. It sounds easy. But not every tool collects data at the levels that prove successful. Other vendors build tools that claim to grant insight into reach, frequency, and overlap, but all of them are lacking in what your team needs to do their jobs. Some only sample data instead of providing a comprehensive analysis. Some don’t give detailed comparisons of user activity across campaigns. Others are just plain slow. Metis Reach, Frequency, and Overlap reports not only provide the traditional tools you need to help control ROI and save wasted impressions but also enables you to gain deeper comparative insight of user activity across your campaigns. Today’s marketing runs faster than ever. Creatives and copy get made on short schedules. Marketers collectively watch campaigns, hoping they’ll perform up to expectations. Afterward, the analysis is done, changes are made, and numbers are obsessed over again. But what happens if you don’t get data that is current and accurate? How do you develop new campaigns if you don’t know what visuals and copy work and what falls flat? That’s where Metis can help. The Metis Marketing Suite solves these problems on a number of fronts. We start with better data. Sampling skews your numbers. We only use the most granular, complete data. Deep analysis and insight can’t happen if your numbers are skewed. Next, we aggregate and process the data faster than other vendors. Detailed reports are no good if you must wait days to get them. 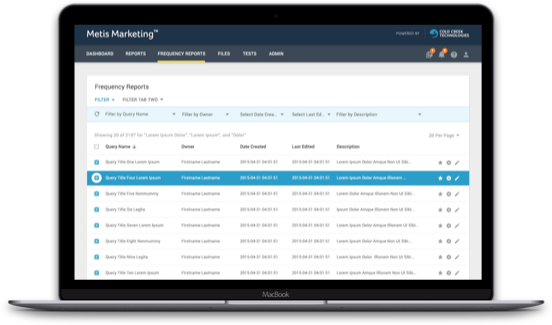 With our RFO and KPI reports, your data is ready in record time. Once you have the raw data, there are options. Data Snapshotting allows you to view a point in time during a particular campaign. Or use our Data Formatting tools to combine raw files from disparate systems into a single file for easier analysis. In big data sets, this process takes days or weeks for human analysts to complete. Our system automates the data stitching and gets it done in hours. Finally, we offer graphing and other advanced visualizations. You can’t dazzle an audience with slides based on sampled or superficial data graphs. You need the comprehensive marketing data only Metis Marketing Suite provides. Add that to our visualization tools, and your charts and graphs tell a deeper, more compelling story. Metis is the answer to the questions of fast-paced modern marketing. Trust our technology to help you run successful live campaigns and get a deeper understanding of the data in your completed campaigns.